We stress that the "customer" is our business and when the customer is happy with their home and builder, they are not afraid to tell people. That is exactly what we look forward to. A large portion of our work derives from our past customers referrals, word of mouth, and impeccable reputation. Our customers take pride in their homes and continually offer to show them to prospective buyers. "Dear Brian, I am without words at how amazing of not only a builder you are, but as a person. I am forever grateful for crossing your path. My house was beautifully built by you - both quality and aesthetically. You displayed an abundance of knowledge, patience, compassion, and care. I am alwasy eager to share with others how brilliant of a person you are. You are a loyal and genuine guy whom I admire. I thank God every single day for my house and all the dedication you put into it. I can honestly say, there is not a thing I would change about it. Your work is beautiful and admireable. At times it seems almost unbelievalbe to me. It's hard now a days to find a true person. You display wonderul qualities. I am honored you built my home. From the bottom of my heart... I THANK YOU. I couldn't have been this happy in a house if I didn't have you there Brian. Thank you for being patient during the process. If you ever need anything, please let me know. I would be honored to help you out in any way I can. "Brian: We want to thank you for everything you have done to help us build our dream home. It is difficult to believe we started this a year ago. Building a house can be a stressful process, but you have been with us every step, placing us at ease and helping us through every small issue. We appreciate your patience more than you know. We would love to help you with additional clients in the future. Just give us a call if we can help in any way. Thanks again!" "When we first decided to build a house, we dreaded the prospect. Our early discussions with other developers and horror stories from friends and family prepared us for a complicated and difficult process. Working with Brian Lantz could not have been any further from this. Brian was there for us all the way through the process, from the lengthy selection for a floor plan, to giving us very professional advice on questions of materials or layouts, but ultimately leaving the decisions to us. By far the most impressive aspect of building a house with Brian was his flexibility. We could select the type of house that met our needs and budget, and had the option of working with his contractors and suppliers or even selecting ours as long as they could meet the schedule. Perhaps, most importantly we always felt we could talk to Brian about anything because we knew he would always give us his unbiased opinion. It was a true partnership and the end-result exceeded all our hopes and dreams. Brian Lantz built a truly outstanding home for us and when the time comes (many years in the future) to build another one, we know who our builder will be." "We are the proud owners of a “Homes by Brian” built home in which we have lived for more than four years. Not only do we have a superbly constructed home, the entire experience was actually enjoyable from beginning to end. Brian Lantz was always very helpful and informative and was prompt to answer any questions or concerns that we had during the entire building process. Most importantly, we were extremely pleased by the professionalism, business ethics and genuine desire to build the best home possible within our budget. We love our new home, especially our “Four Seasons Room” where we spend most of our time looking out over our lovely wooded backyard! The quality is beautiful, exceptional. We can’t say enough positive things about it. We would give our highest recommendation to Brian Lantz and “Homes by Brian.”"
"Eleven years ago we started looking for a new home and by chance, we discovered two new homes that were just completed by Brian Lantz. 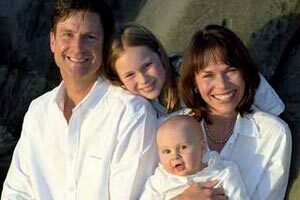 My wife, our children and my parents were all overwhelmed by the quality of the homes. We then decided to have Brian build us a new home. We had a great time during the building process and appreciated his help and guidance. Ten years later, Brian built us another "Dream" home. Brian helped us with all the planning and details of the construction. He offered many suggestions, explored the various options available and kept us informed every step of the way. We wanted a large kitchen but the home plans provided a smaller space. With Brian's help we increased the size of the kitchen. One day, Brian and his cabinet man met us out at the jobsite and marked out a proposed cabinet layout on the floor. After seeing the "mock-up" versus the original layout, we loved it and made the change. Now, my wife has the kitchen she always wanted. Brian went above and beyond by doing this along with many other things during the construction phases. We are very happy with our new home. Everything is done so nicely and we are very proud to show it off to our friends and family. The workmanship is excellent, the building products are the best and his team of craftsmen are second to none! Brian Lantz is a very honest, trustworthy person and a great builder. He is not only our builder but our friend!" "We are pleased to offer this letter of recommendation for Homes by Brian. From planning, design, pricing, to execution, we felt comfortable working with Brian each step of the way. 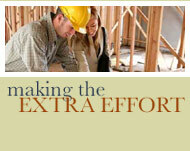 The complex process of home building was made easier with the dedicated group of contractors and subs he works with. Our home is completed and it is a show place in every respect. The quality of workmanship is top notch and we continue to receive compliments from friends and strangers alike. We are convinced that we could not have chosen a better builder for this important project. We highly recommend Homes by Brian as a top custom homebuilder. We would refer friends and family for a wonderful custom home building experience to Brian Lantz"
- Bruno and Loris VanderVelde. "Just a Thank You note to let you know how much we love our new home. We know it’s a lot bigger than the first one you built for us but it won’t take long for us to fill it up. As mentioned before, if you ever need to show it to anyone, just let us know. We know they’ll be as impressed with it as we are." - Steve & Kathy B. "We’re dropping you a note to let you know what a terrific and pleasurable experience it was throughout the entire building process. We enjoyed dealing with you very much and all of your subcontractors were great. We’re very proud of our home and will recommend you to everyone we know." "Jim and I wanted to express our gratitude and let you know how much we love our new home. It was a very pleasant experience dealing with you from beginning to end. We love to brag about it to our friends and tell them what a great guy you are. It was fun. We really appreciated the extra time you spent with us. It just goes to show why you have the great reputation that you do." We just wanted to say it was as fun the second time around as the first time you built our home. It has always been a positive experience dealing with you and your crew. You really have great people backing you up and the quality of their work really shows. Everyone really made us feel comfortable during Both times you built for us. If we ever build a third home, I’m sure you’ll be the one to do that one too! That is, if your not retired by then. "Thank You, Thank You, Thank You. We just wanted to let you know how much we love our new home. It was so much fun following it from beginning to end. You were a dream to deal with the entire time and hope I didn’t drive you nuts with all the phone calls. Seriously though, we will recommend you to everyone we know and tell them that there is a builder out there who still truly cares. You are always welcome to show our home to anyone you want in the future." "Just sending you our yearly Thank-You card on our 7th anniversary of our home. We love it as much as when you first built it and we can honestly say you helped make our house feel like a home. 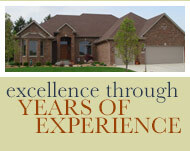 You built us a quality custom home with close attention to detail. We continue to tell people how much we love the house even 7 years later. Thank you Brian. We know that when people build with you, they'll be happy." "On the advice of my mother-in-law, we met with Brian Lantz at a spec house in Eagle Ridge in September 1997. We were able to see the quality of his workmanship and knew that he would be the builder for us. Brian realized that everyone's financial situation is different, so he came up with a proposal to help us build our first custom home. Nine years later we called Brian again to build our second custom home. After several meetings and adjustments to the floorplan, Brian constructed a home that exceeded our expectations." We feel that we have gained a great friendship with Brian. He is the easiest person to work with and his subs are excellent at what they do. We would highly recommend Brian Lantz to anyone considering building a custom home.